Rapid and reliable actuation of gate valves is becoming more and more critical to liquid and gas handling applications as industries face the twin demands of production automation and pressure to produce without production interruptions for maintenance. Gate valves, also known as sluice valves, are one of the most widely used types of valves in industrial applications, where they typically operate either fully open or fully closed, being used in pipelines as isolating valves rather than control or regulating valves. Their compact simplicity, low pressure loss, bidirectional versatility and ability to handle full flows where particles cannot cluster has led to widespread use in process engineering applications throughout industries such as food and beverage, agribusiness, manufacturing, mining and mineral processing, liquid-solid separation, filtration, materials handling, water and waste water and waste-to-energy projects. Typically gate valves are manually or (occasionally) hydraulically actuated, but where faster or remote actuation is required, they usually rely on conventional pneumatic actuation using a cylinder with rods and seals. However, an alternative means of actuation is available to process engineers charged with designing pipeline and reticulation systems that respond to the needs of automation and uninterrupted production demands. These flexible-wall, bellows-type Airstroke actuators – manufactured by Firestone and distributed throughout Australia by Air Springs Supply Pty Ltd – are tough, fabric reinforced rubber balloons of different shapes engineered to perform different tasks. The simple single, double and triple-convoluted airbags operate without seals, shafts or internal moving parts to provide ultra-reliable actuation alternatives for materials handling technology exposed to grime, debris and waste, which can disrupt the seals and shafts of convention pneumatic and hydraulic cylinders. 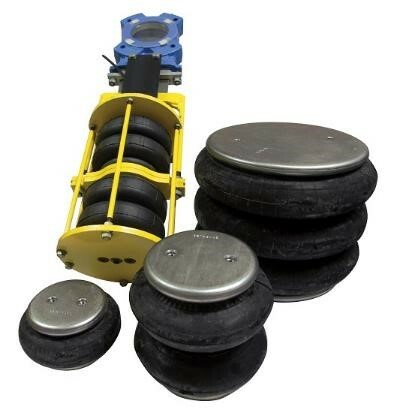 Structurally they are identical to the enormously durable and reliable Firestone air springs used as OEM equipment in the suspensions of huge trucks and semi-trailers. This proven reliability under some of the worst conditions imaginable – like being continuously battered on Outback roads at extreme ambient temperatures – is what makes Airstrokes so tough. It’s engineered into their DNA. The globally proven Airstroke range comprises single, double and triple convoluted models with strokes up to 300mm. They suit applications requiring clean actuators that don’t need lubrication, but which can also cope effortlessly with dirt and grime. A big plus in some applications is that Airstrokes can stroke through a radius without a clevis, thus eliminating both complexity and cost when engineers need to actuate through an angle. Their ability to soak up shock without damage while delivering high-repetition strokes means they are also highly applicable to engineering applications ranging from stamping and clamping to pumps and conveyors.